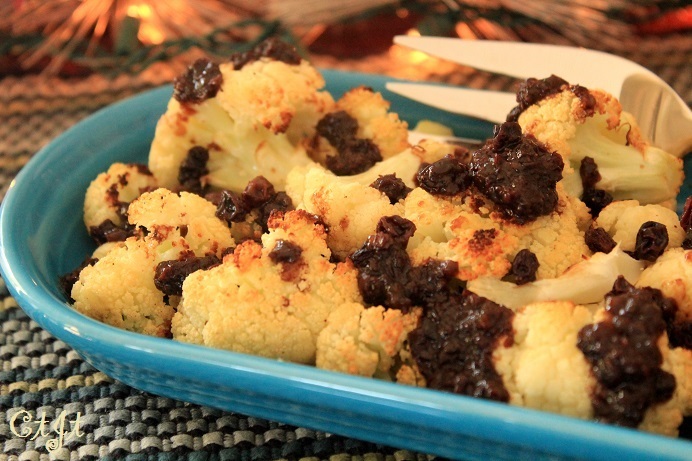 A slightly chunky currant sauce with Sigona’s Black Currant infused balsamic dresses up roasted cauliflower florets to make this simple side dish special enough for a dinner party. Adapted from Vegetarian Times. Serves 4 as a side. Directions: Preheat oven to 425F degrees. Toss the cauliflower and garlic with 2 TBL olive oil, then season with salt and pepper. Spread in a single layer on a baking sheet and roast, turning occasionally — about 25 to 30 minutes or until florets tender and are browned on edges. Meanwhile, make the vinaigrette by placing currants in heat-proof bowl or measuring cup and cover with 1 cup boiling water. Let stand 15 minutes or until softened and plump. Reserve 1/4 cup of the soaking liquid and, separately, 1 TBL of the currants. Drain the rest of the currants. In a food processor or blender, blend currants, reserved soaking liquid, 3 TBL olive oil and balsamic until smooth. Season with salt and pepper, if desired. 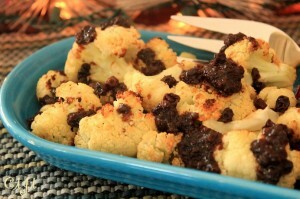 Transfer the roasted cauliflower to a serving dish. Remove garlic cloves, if desired (guests probably don’t want to bite into an entire clove). Drizzle with the vinaigrette and sprinkle with reserved 1 TBL currants. Serve. Don’t let this short list of ingredients trick you into thinking this dish won’t have much flavor. Roasting the vegetables gives this soup a lovely depth of flavor without any heavy cream or extra fat. You’ll love the hint of cardamom, too. Serves 2 to 4. *Try a drizzle of our Sigona’s Black Truffle oil for a twist and another layer of flavor. **Of course, you can use chicken broth, if you’d prefer. Toss the cauliflower, garlic and leeks with 2 TBL olive oil, then season with salt and pepper. Spread in a single layer on a baking sheet and roast, turning occasionally, for about 25 minutes or until lightly browned. Reserve 3/4 cup (about 4 larger florets) of roasted cauliflower florets. Chop into 1-inch pieces. Set aside. In a medium pot over medium-high heat, add the broth, the bay leaf and the rest of the roasted vegetables. Season with cardamom, nutmeg, salt and pepper. Bring the mixture to a boil then remove from heat. With an immersion blender (best choice), food processor or blender, puree the soup (in batches, if necessary). Please check manufacturer’s instructions for pureeing hot foods. After pureeing, stir in the reserved, chopped cauliflower. 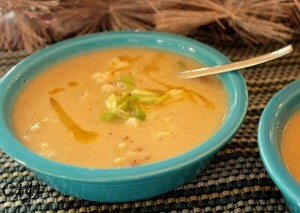 Ladle the soup into individual bowls and drizzle each with about 3/4 tsp. olive oil (or truffle oil). Top with sliced green onion, chopped chive, kale chips, diced bell pepper or bacon bits. The flavors in this dish play together nicely, with the currants adding just the right amount of raisin-like flavor to add a surprising, subtly sweet factor. Serve with a white meat or fish. Serves 4 as a side. Adapted from Eating Well. Directions: In a large skillet, add olive oil over medium to medium-high heat. Add the shallot and season with salt and pepper. Sauté about 3 minutes or until the shallot begins to soften. Add the kale and stir. Cover and cook for about 2-3 minutes. 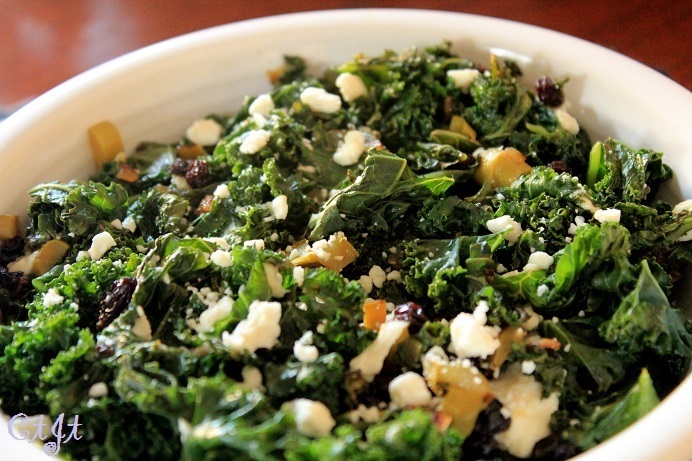 Remove the lid, stir and cook another minute or until the juices have returned to the kale. Stir in the green olives and currants. Dot with crumbled cheese over the top. Cover again and allow cheese to melt a bit, about 2 minutes. Remove from heat and serve. Garnish with more goat cheese and currents, if desired.